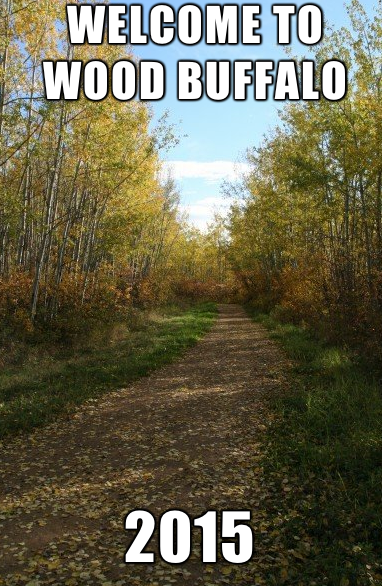 McMurray Musings: Welcome to Wood Buffalo, 2015! 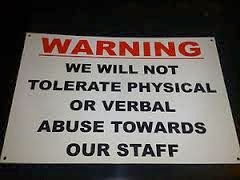 For the record not one person came out in favour of this sign, one that appears in so many of our institutions, businesses and organizations. Not one person felt the signs were a good idea, imparted the right message, or were even effective. Most people expressed their own concerns with these signs and the real message they give, especially to visitors to our community who must look at these signs and think this place is full of abusive jerks who are willing to harass people at the drop of a hat. These signs, the general consensus seems to be, must go. And the time, my friends, is now, because I am making it a goal to rid our community of these signs by January 1, 2015. Why such an arbitrary date? It isn't arbitrary at all, actually. A couple of days I ago I had the honour of attending the Regional Sport Tourism Awareness Breakfast, an event where community stakeholders discussed the sport events coming to our region in 2015. In 2015 we will welcome five major sport events, all occurring between March and August. During that time we will see athletes, coaches, fans and supporters of the Canadian Ringette Championships, Crescent Point Energy Western Canada Cup, Northern Kickoff, FC Edmonton and 2015 Western Canada Summer Games come to our community. These events will host approximately 3,800 athletes, and they are expected to attract about 100,000 attendees. That is not a typo, incidentally. 100,000 people, many of which will be local, but some of which will be coming to our community for the first time and forming their opinions of who we are, what we do and what we value. And you know what I don't want them to see? These signs represent a tremendous liability for us when we have people visiting our community. If their first impression of us is this sign then we will have a very difficult time creating the image we want them to leave us with - of a warm, welcoming community. If we want to create new ambassadors for our region we must ensure they see the right message. These signs imply we have a much darker side, one far closer to the reports external media spews about us, and so they must go, and they need to go by 2015. Those sporting events don't even include other visitors to our region who come here for art and culture events, touring performers or family members who drop in for a visit. If we think about the potential for impact these signs pack a powerful punch, as each one can lead to visitors forming a negative opinion about our community, and an opinion that does not reflect who we really are. Far from protecting us these signs are hurting us, and the hurt will get worse if we do not address the issue before we begin hosting guests from all over the nation - and so the time to start is now. But what to do? Well, this is where we need to take action, and get vocal. The next time I am in a business with one of these signs I am going to ask to speak to the manager, or get an email address or phone number where I can contact them. And then I am going to explain to them why we need to remove these posters, and what the real message that they are sending is. I will gently suggest they remove the posters and find others ways to address these issues (which existed and were addressed long before anyone decided this poster was necessary). And then I will explain why if the poster is not removed I will be compelled to take my business elsewhere, because I cannot support businesses that engage in actions that will harm my community in this manner. With some this may be trickier than others, of course. At the doctor's office it might mean an email asking them to think about why they have this poster, if it is truly necessary, and if instead they could change the message to a more positive one, like "Thank you for your patience and understanding" or "Thank you for treating our staff with respect", and coming from a place of positivity instead of negativity. Hopefully it will begin a dialogue within those organizations and business about these signs, and if they are truly doing anything to address the issue or if they have just become part of the wallpaper, unnecessary and outdated. This is my campaign to rid our community of these posters. Maybe you have other ideas to do so, which I hope you will share and implement yourselves. I think we need to change the message, and I am planning to hashtag it for Twitter purposes as #wbwelcome2015 - because by 2015 I want us to be the most welcoming, warmest community in the nation as we welcome guests from all over the country to our region. It might be a challenge - but then again, challenges are when you really have an opportunity to shine. Our time to shine lies just ahead of us - so welcome to Wood Buffalo, 2015!